When the technological progress on the verge of real-life sci-fi movie mixes with the traditional spirituality, we get a glimpse of what contemporary art in Japan might look today. 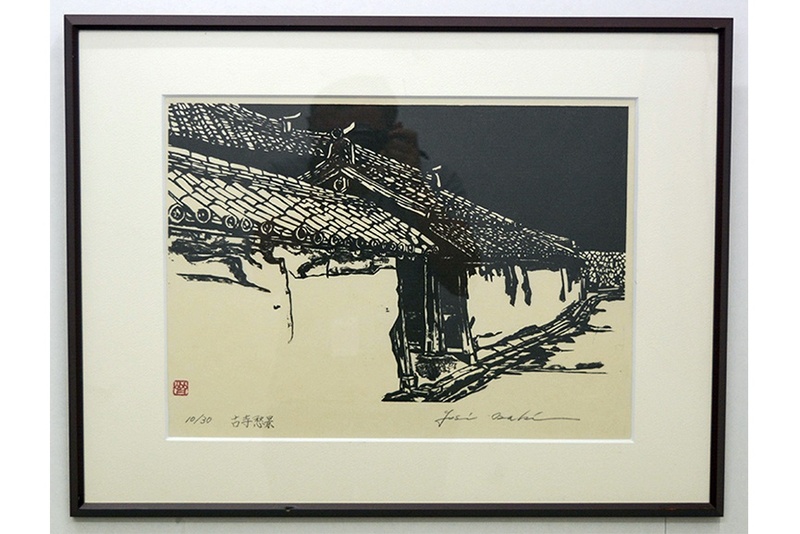 This historically and culturally profuse Far East country is the home of anime and manga, as much as the birthplace of the fine ink painting and contemplative brushwork. 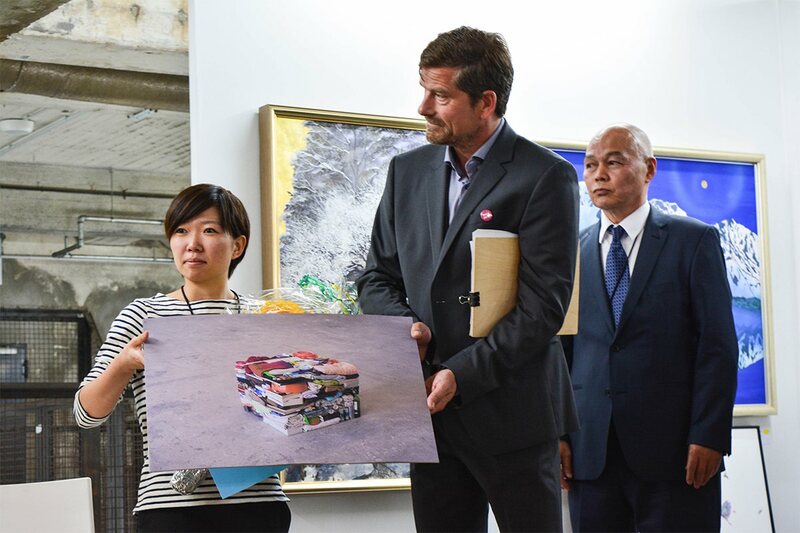 Zen intertwined with hysteria of urban metropolis such as Tokyo exudes from many artworks and most definitely from the very colorful Japanese Young Artist Group, a special section presented at the Berliner Liste art fair 2016. Walking through the installation of over 150 pieces executed by 113 young artists from Japan, we could not but experience a form of visual saturation and bewilderment. 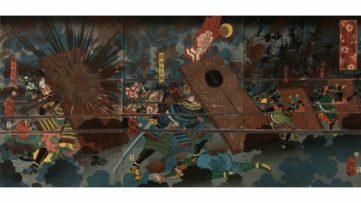 The eclecticism of Japanese contemporary culture radiates from each of the booths, evoking flashbacks from history in the ink paintings and paper-based work, while at the same time toying with the ever present kitsch and modern, plastic materials in others. It was a serious task to single out our favorite pieces, as any criteria fails in such a disparate environment. However, we did our best and the choice we’ve made is laid out below. 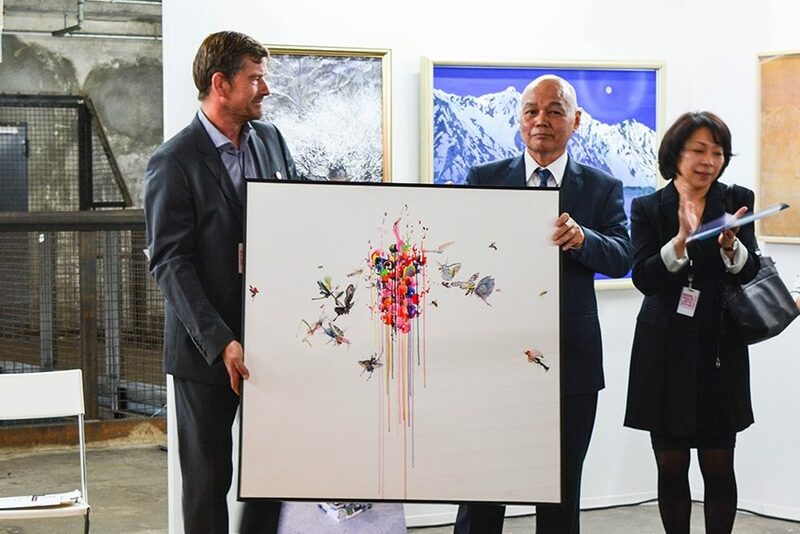 Curated by artist Rin Terada, the Japanese Young Artist Section announced an award for the most successfully executed piece of the Berliner Liste exhibition, selected together with the curators of the art fair – Dr. Peter Funken, Stefan Maria Rother and Guillaume Trotin. 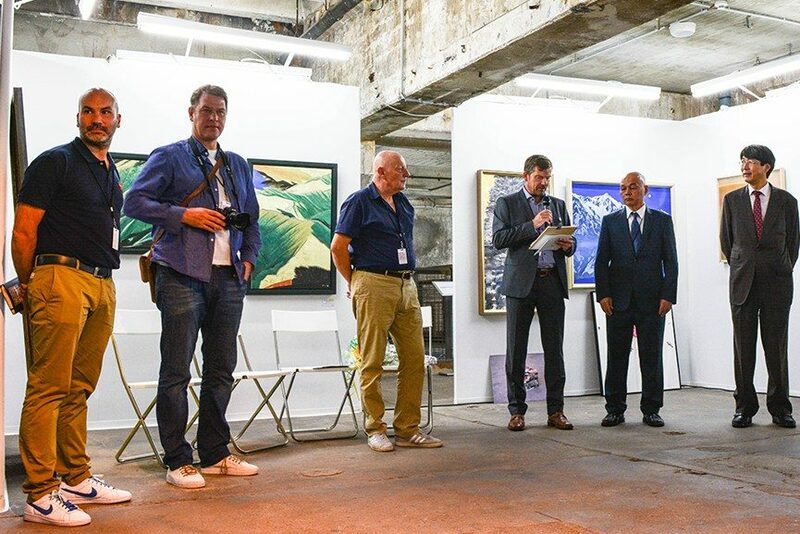 This is the first such award for young Japanese artists in Germany to date. For the first Japanese Young Artist Group Award, the jury has made a special selection of two winners, who will split the first prize of 1.000.000 Yen. 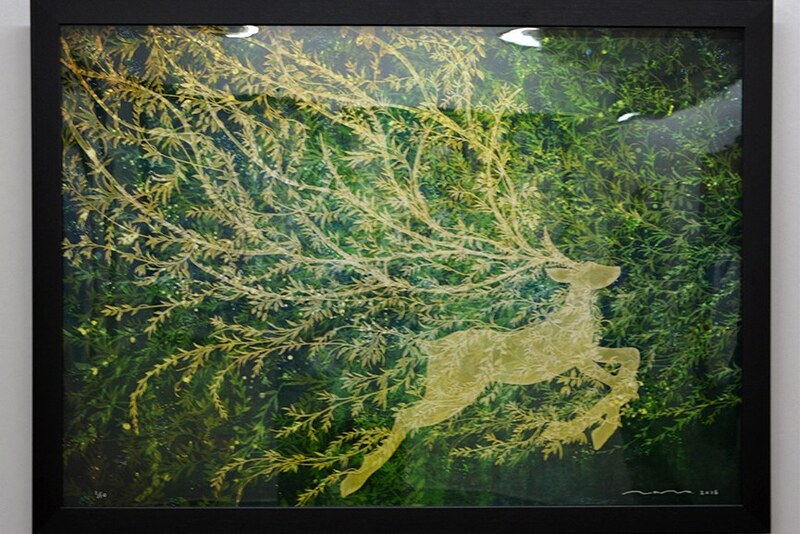 The winners are two ladies this year: Aira and Kai Oshima with her photographic series of 5 pieces. Aira is definitely one of our favorites from the section, with the work “Grape 3”. 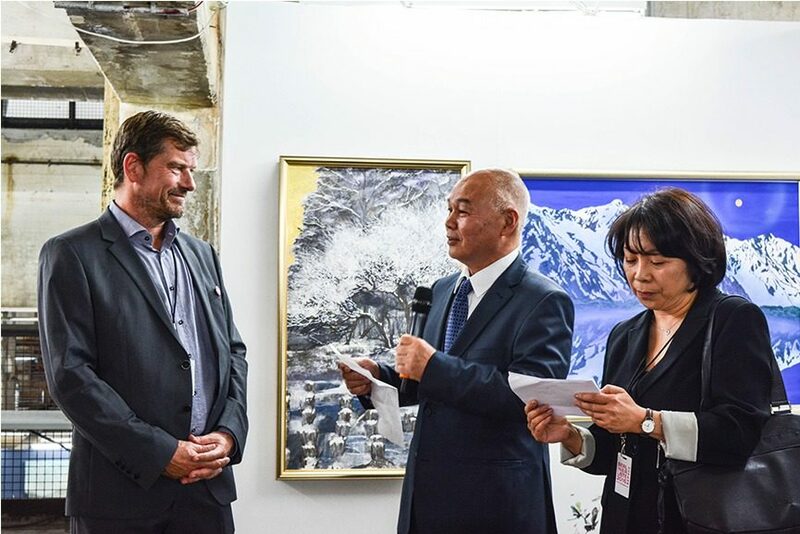 The surprise came after, in the form of a Special Award, which went to the artist of the Neodent Gallery, Marek Slavik, who won the special trip to Japan, funded by Rin Terada. 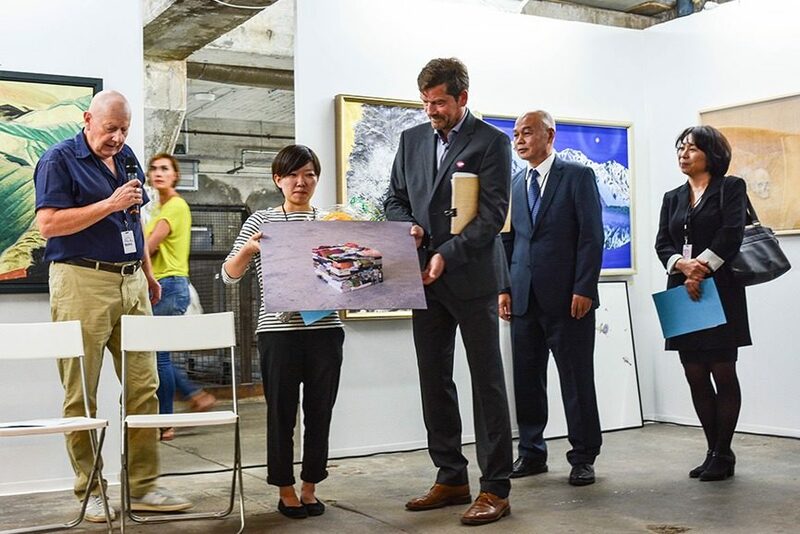 Note to collectors: Many of the artists presented at this year’s Japanese Young Artist Section are already considered rising stars in Japan, while they are still to make a name in the West. The Berliner Liste Art Fair is just the perfect opportunity to attain some of these pieces at more than attractive prices. A very young artist from Japan mixes traditional floral motives in a rather western manner. She utilizes photoshop as a medium for her artistic expression, while the imagery is decorative and contemplative at the same time. The artist who is yet to grow, while walking the right path. 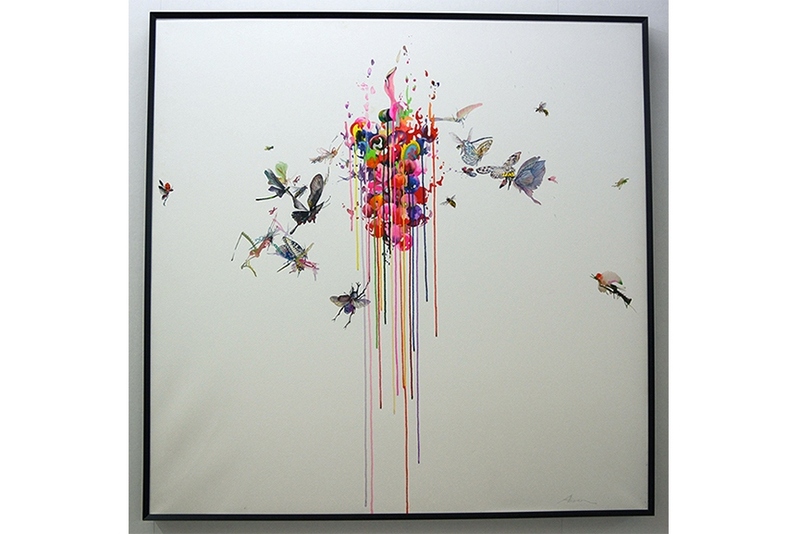 Nana’s “Fly Away” is one of the pieces we liked at the Berliner Liste. Animals have always had a strong position in Asian art, as each one of the carries deep symbolism and a particular meaning. 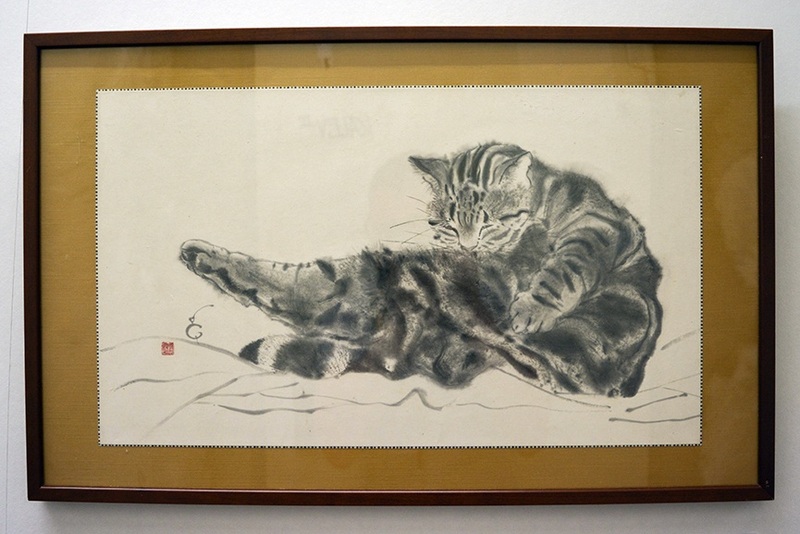 “Cat” by Chizuko Demachi reminisces of the far-eastern tiger paintings, while bringing a completely new, contemporary sentiment – one of domestic bliss and utter relaxation. The cat is a pet here, although executed with a traditional outlook . We loved the combination. 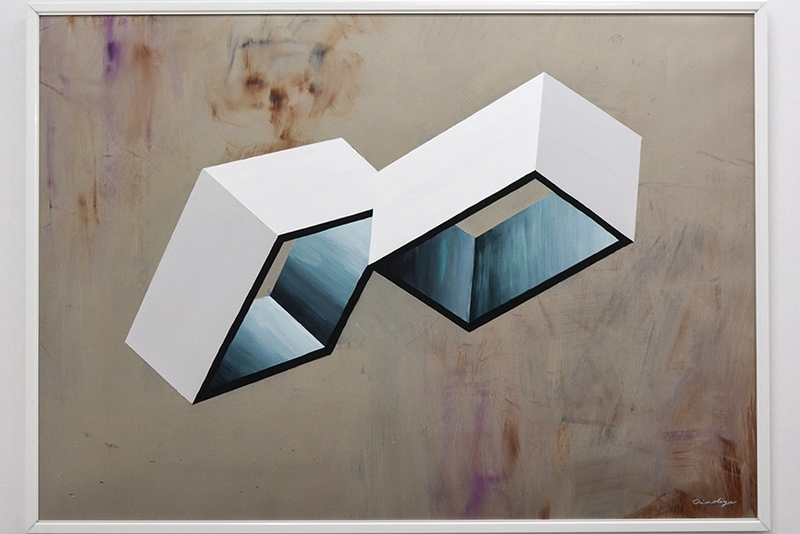 Exploring the abstract geometry, Ai Moliya is playing with the composition, color and precise paintings. The works of this artist from Japan have a certain sense of balance and tranquility, while they remain completely abstract, painted in the shades of pastel pink, light sand, accents of white and thin black contours (a traditional trait, perhaps). Like an entrance to another dimension, the colorful geometric composition made by Manami Tagawa is more than a decoration. It’s an object-painting, where noticing the fine segmented texture is an integral part of the viewing experience. Still, color plays the main role here, remaining in the harmoniously composed pastel and dark cold shades of blue, lilac, beige and yellow. 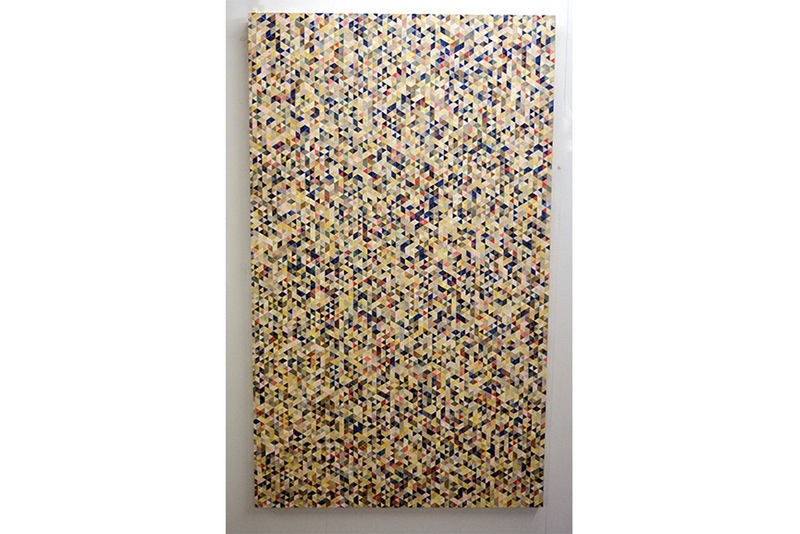 It’s all about texture with the works belonging to Yuki Yashiro! The gallery-format depictions of animals ooze an almost chagall-esque palette and a new, clearly Japanese approach to motif. Birds in this painting might even be a genre scene, a contemplative composition, here in the service of the art of painting and different approach to the medium, mixing pastel with oil and watercolor. Drawing on Chinese paper and black & white might sound traditional, but the visual impression Shiomi Kurihara’s works give out a different feeling. 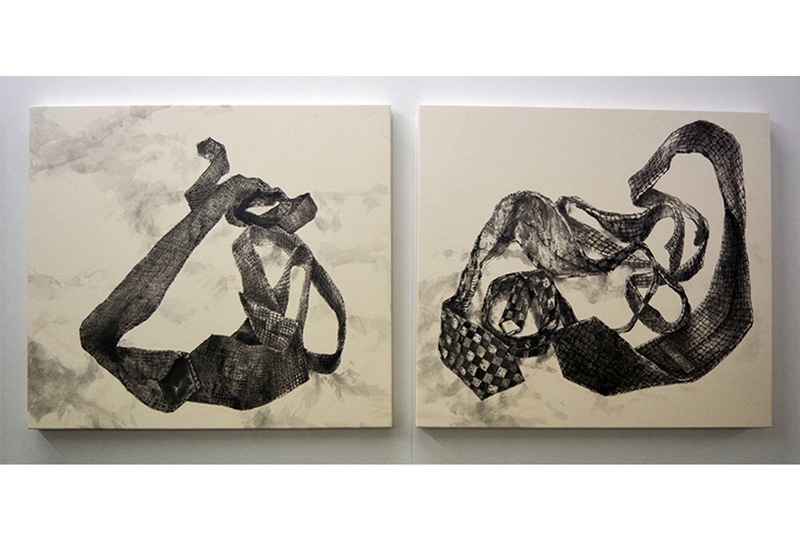 “Necktie” 1 and 2 are almost abstract pieces, studies in draughtsmanship, with visible influence of calligraphy. Coming in pair, the pieces work either as a diptych, but also separately. 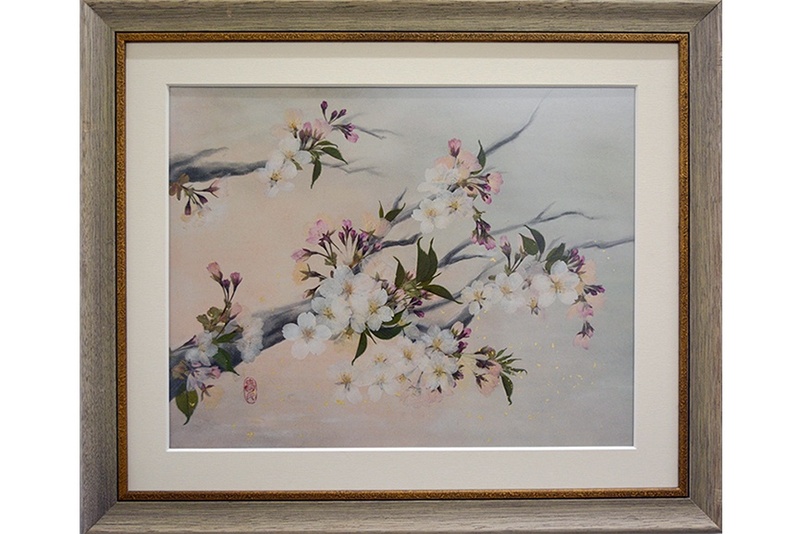 Delicate Cherry Tree, one of the most traditional Japanese symbols of beauty, has never left the art, but here it is brought in a slightly different manner. The gentle, pastel palette is conjured – not with paint – but with actual, pressed cherry flowers and leaves, perhaps celebrating the cherry blossom from a new, modest angle. Aiko Arai brings out the refined Sakura into a new setting, humbly painting the background alone, as the composition results in a lovely, harmonious and very Japanese image. 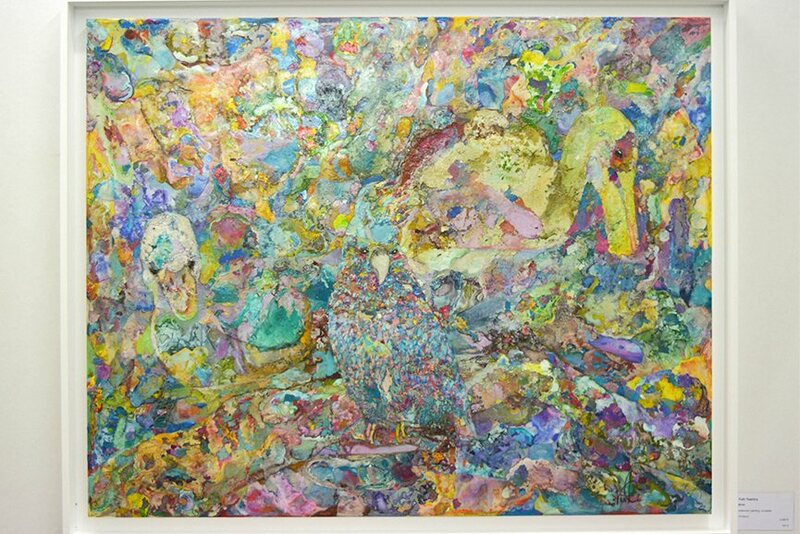 Mixed media is the technique behind this bold piece by Hiroaki Tsujii, who finds inspiration in both Japanese calligraphy and perhaps event the Gutai painting style. 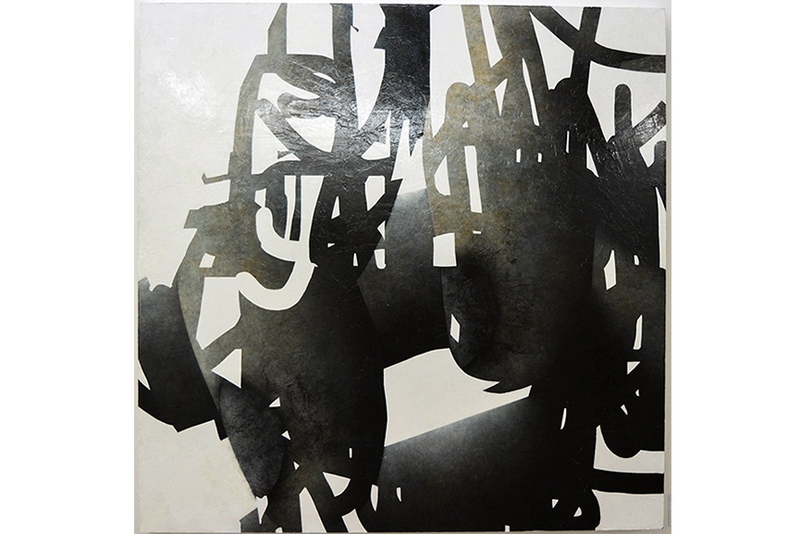 Bold black strokes on white show elegant changes in texture, while maintaining the visual unity of the piece. 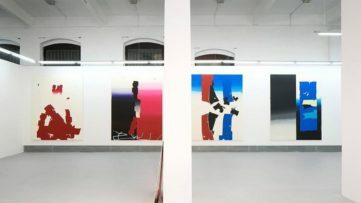 Abstract and associative, “Rebuild” made a strong visual impact evoking modernity and tradition alike. Simple, traditional woodcut by Yoshiaki Ozaki is everything one can expect from a contemporary Japanese print. Unpretentiously, it brings a familiar scene of a house, emphasizing the details of the rood and the door, while the white portions of the print speak volumes. Perfectly balanced, “In the Autumn” is one of our favorites of the section. A delightful work by Aira, “Grape 3” mixes the traditional paper-based watercolor with a different kind of imagery, mixing natural elements with pure color, abstraction and pop-art. The dripping smears make the perfect contrast with the minutely painted insects, drawn to this mysterious formation in the center. Our favorite of the Japanese Young Artist Section, Aira, seems to be the one rising star that might just shine in Europe as well.